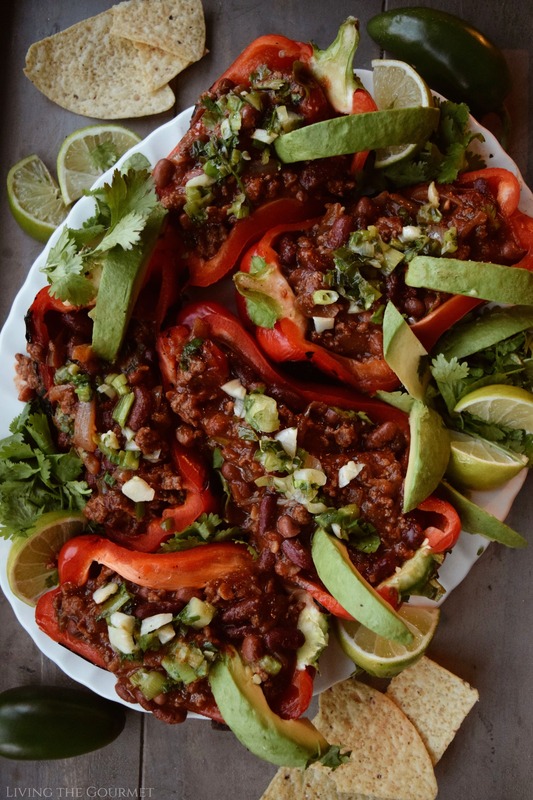 We’re serving up our favorite chili in charred bell peppers for the ultimate weekend (or midweek) dinner that will have the whole family gathered around the table! No, you are not having a case of digital déjà vu. Instead, I am knowingly committing one of the few true ‘mortal sins’ of content creation –reproducing something that is likely well within the recent memory of you my regular reader. That is, I am reimagining a recipe that I’ve posted just several weeks ago, but to be perfectly honest, I just can’t help myself. My previous chili was a completely vegetarian experience, one that was equal parts guiltless-ness and taste, the sort of chili that you prepare when you’re trying to keep your New Year’s resolutions intact while still having something ‘substantial’ to enjoy. However, after posting that, it struck me that I hadn’t put together a ‘traditional’ chili in…well, forever. 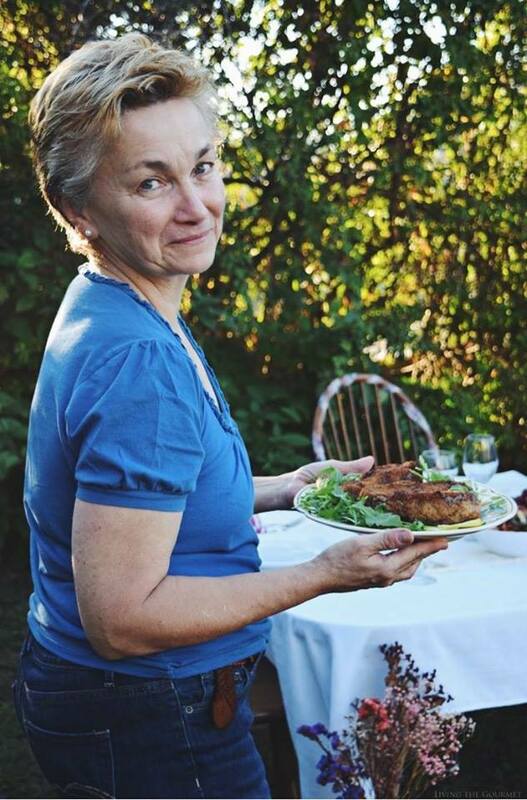 You the know the kind of chili I’m talking about, the kind that gets poured into cheese laden wraps, or stuffed into crisp taco shells, or paired with nachos, or simply served in a bowl topped with sour cream, cheese, and perhaps a dash of hot sauce. 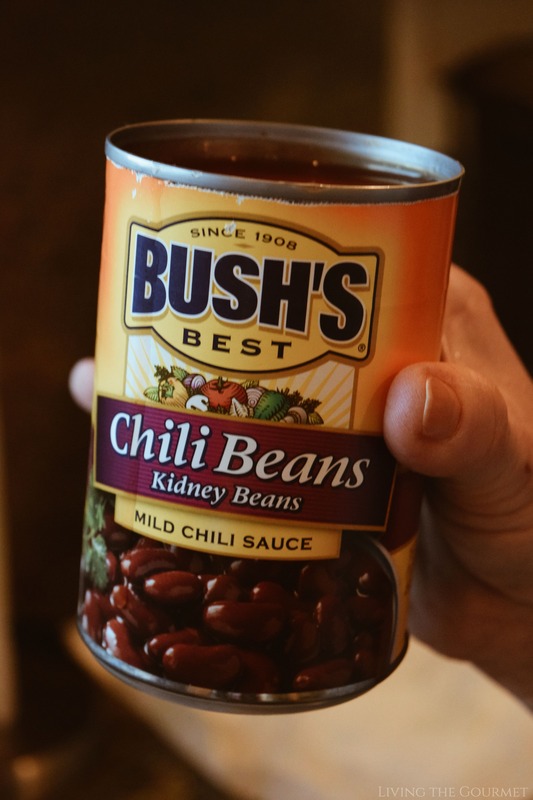 In case you hadn’t guessed, my friends over at BUSH’S® are helping me do precisely that for this post, courtesy of their Red Beans in Mild Chili Sauce, and their Kidney Beans in Mild Chili Sauce, which are, as the names imply, intended precisely for delicious homemade chili. The upside to using this particular flavor and style of beans is that they come slow-simmered in a chili sauce prepped with a blend of chilies, garlic, onions, and assorted spices. 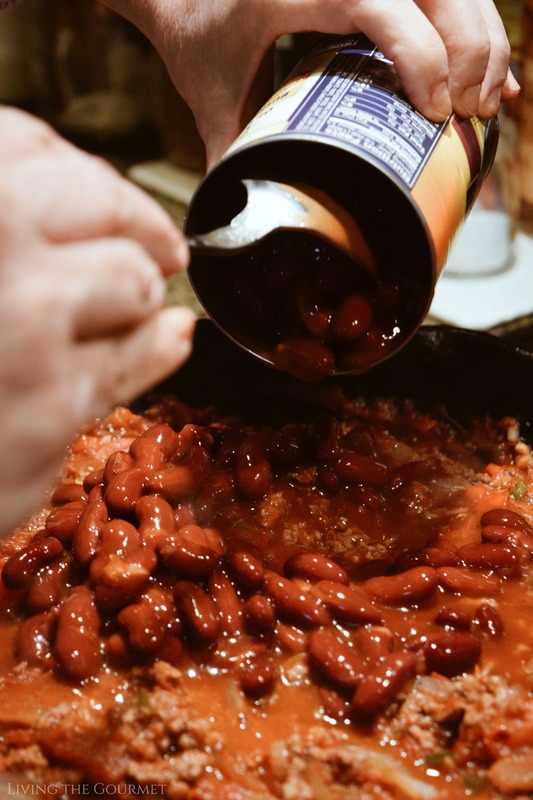 In essence, it’s a giant time saver so that you don’t either have to pre-prep the beans yourself or opt to use beans that been pre-simmered in chili sauce, essentially removing an entire layer of flavor from your recipe. Let’s be honest, when was the last time you actually took the time to pre-simmer your chili beans? If you’re like me…you probably haven’t ever, since that’s pretty much an all-day affair. Now, to start things off, we begin by charring bell peppers stovetop right on the burner. Note that you can also do this in a dry cast iron pan if you prefer. Either way, you ‘only’ want to char the outer skin of the pepper. Note that you do ‘not’ want the pepper to become ‘mushy’ or over pliable. You ‘only’ want to char the outside of the skin, not cook them through. If you cook them through, or they become soft, you can’t use them as boats to serve the chili. Next, heat a large cast iron frying pan – dry. Then place the cherry tomatoes in the pan, and dust them with a bit of salt, and then allow them to char. Once the tomatoes have achieved a slight char, squash them down with the flat a fork or a spatula. Be careful not to have them squirt up at you during this process. Next, drizzle the pan with a bit of olive oil, and add in diced onions, and allow those to golden while they cook with the tomatoes. Add in chopped garlic and diced jalapenos, and allow this mixture to cook down before adding in two cups of crushed canned tomatoes, and let that simmer over a gentle heat for about ten to fifteen minutes. Note that you are not fully cooking the chili at this point, you are simply simmering it down. Meanwhile, heat a second pan, and fully cook about a pound and a half of ground beef on its own. Once the beef has fully cooked, add it to the pan with the tomatoes. 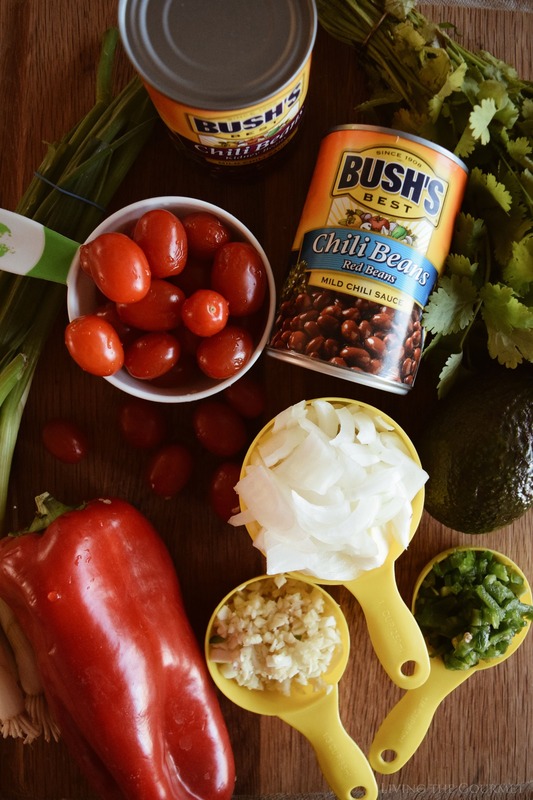 Finally, add in the BUSH’S® Chili Beans to the mix, we’re using Red beans and Kidney beans in mild chili sauce. Then add in the seasonings listed below, and toss. Again, the big benefit here is that the beans have all-day prep flavor, without having to take all day prepping them yourself. On a side note, these are also available in pinto, black, white, or mixed bean varieties, as well as coming in mild, medium or hot sauces. Today, we’re using the Red beans and Kidney beans in mild sauce simply as a matter of preference. After tossing the chili, add in molasses and balsamic vinegar, and then continue to cook over a gentle heat, loosely covered for about thirty to forty-five minutes. 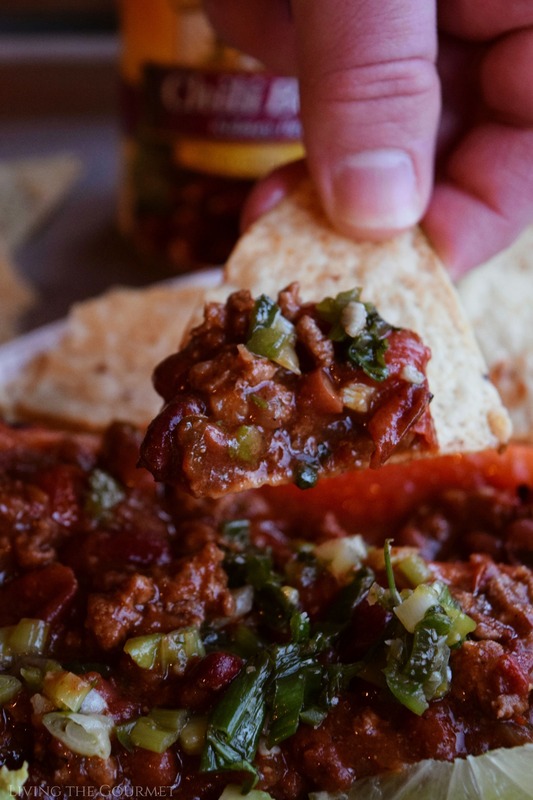 When you are ready to serve the chili, simply halve the charred peppers, carefully remove the seeds and rib and then carefully fill each half with chili, and serve with your favorite toppings. Char the bell peppers and set aside to cool. Heat a large cast iron frying pan. Place the tomatoes in the dry pan, sprinkle with salt and let them char. When the tomatoes have charred gently smash them down. Drizzle a little olive oil in the pan and add the diced onion and allow to become golden with the tomatoes. Add in the garlic and toss with the onions and tomatoes followed by the diced Jalapeno’s; toss and cook down. Add in the two cups of crushed tomatoes and continue to simmer on a gentle heat. Heat another cast iron frying pan and cook the ground beef. Lift the ground beef from the pan with a slotted spoon and add to the pan with the tomato mixture. Add the BUSH’S Chili Beans and continue to cook on a gentle heat. Add the seasonings and toss. Add the molasses and the balsamic vinegar and continue to cook on a gentle heat, loosely covered, for 30 – 45 minutes or longer. Carefully halve the grilled bell pepper and fill with the chili. Heat a small cast iron frying pan with a tablespoon of olive oil. Add the chopped scallions, cilantro and jalapeno and saute for a minute or two. Drizzle over the chili boats, along with a drizzle of honey. 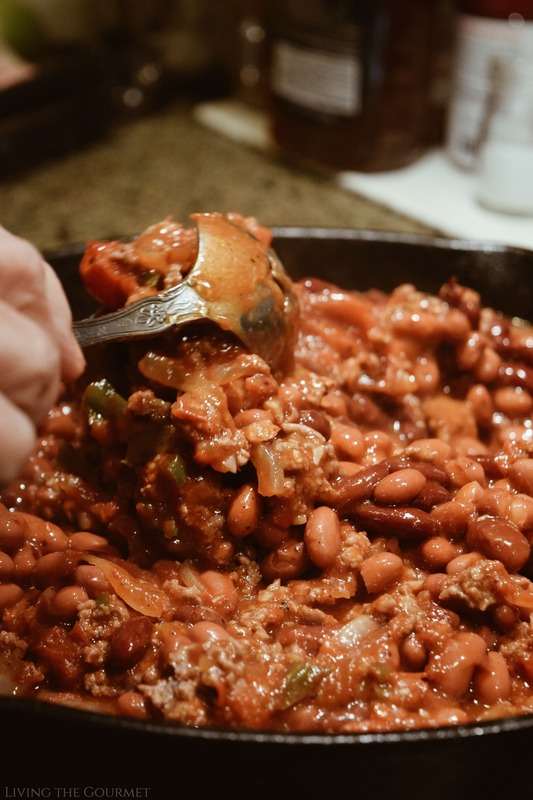 What are some of your favorite ways to serve or prep chili? We’d love to hear from you. Also, don’t forget BUSH’S satisfaction guarantee. If you are not satisfied with the BUSH’S® Chili Beans product you purchased, you can register to receive a coupon for a free BUSH’S® Beans product up to 16 ounces. This could include BUSH’S® Baked Beans, Variety Beans, Savory Beans and moreSome restrictions may apply. Visit bushschilibeansguarantee.com for complete terms and conditions. I love all the beans and legumes! These stuffed peppers are mouthwatering. Everything about this is amazing! I can't wait to make this for my family. They're going to love it. I have had stuffed peppers before, but never with chili. 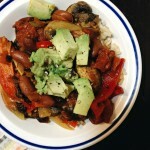 I could eat this dish on a cold winter evening, as it sounds like it warms you up and it's very hearty as well. I like that you chard the peppers on the open flame before, that gives them such a better flavour. Those peppers look absolutely amazing! Wish they were on my plate! I'm not just saying this because it's a sponsored post, but Bush's beans are my favourite. We buy them whenever we can find them. They are not readily available at my local grocer. I'v never tried the chili version though. Are they new? 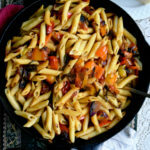 I love that you charred the peppers first - what a great way to add more flavour to the dish! 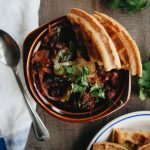 My husband loves making (and eating) chili; I need to share this with him! What a unique twist and it sounds delicious! Thank you. I hope you and your hubby enjoy it if you give it a try. 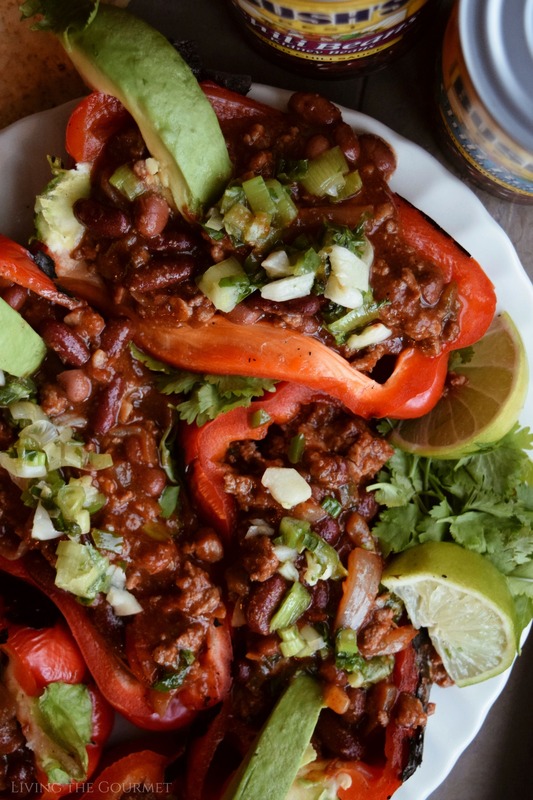 YES Give me all the Chili STuffed Pepper Recipes! This look so tasty and delcious! Sometimes you have to recreate your recipes in a different way. 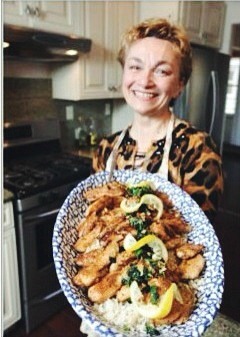 :) My mom would love this recipe! I'll have to send it to her. Everything about this is sooo amazing! Now I am starving and I cannot wait to try this out! Btw I love your pictures...have you thought about making videos as well? Thank you for your kind words. I have thought of making more videos. These look delicious! And what a fun way to have chili - I never thought to stuff a pepper with it! 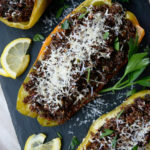 I prepare stuffed peppers but on different way ! This is nice and creative change and I like it very much ! Thank you ! thank you Mahy. I hope you enjoy it if you give it a try. These look so good! 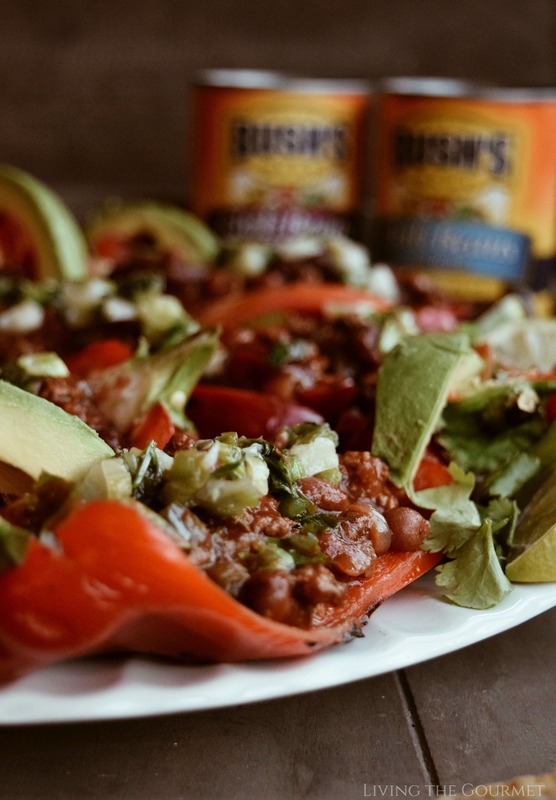 We love stuffed peppers as a meal option but have never stuffed them with chili. Delicious. I've always loved chili but mine never seems to come out right. I've actually given up on making them but I might just pay it another visit with this recipe.. I hope you enjoy this recipe if you give it a try. Let me know how you like it. 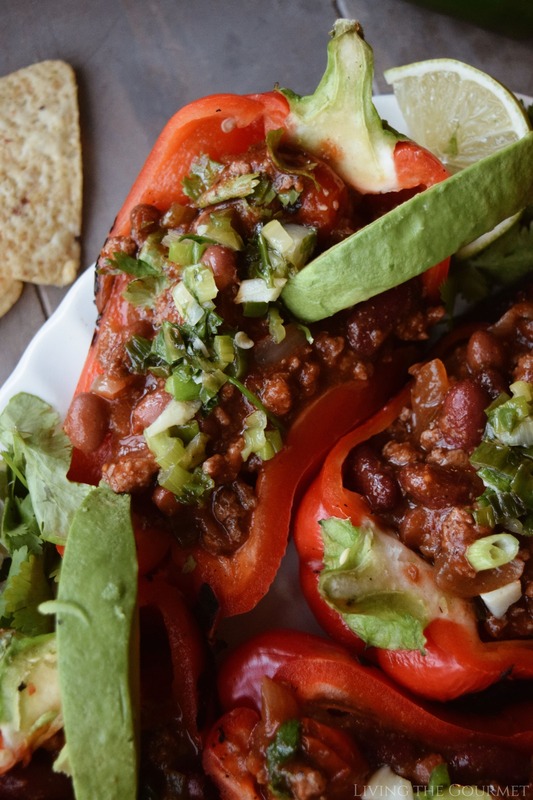 I love chili, and what a fantastic idea to stuff it into peppers! 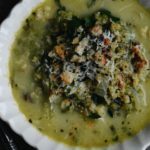 My family would love this recipe and I can't wait to give it a try! Thank you. Let me know how you enjoy it if you give it a try. These Chili Stuffed Peppers is the best selection for this coming weekend. I can't wait to try them out! Thank you John. Let me know how you enjoy it if you give it a try this weekend. Ok yum! I have to make these!! How do you think they’d do in the crockpot? I really don't know Erin. I don't really cook with a crockpot, and would not want to give the wrong advice. The recipe does not take all that long to make, simmers at a very gentle low heat. If you give it a try please let me know how you like it. Thank you for visiting. Wow, I have never tried to make a chili stuffed pepper and this recipe looks really delicious and easy. I will try to make this for my kids, thanks for sharing! Wow, I love this recipe it is so delicious and look so easy to prepare. I will def try to make this for the whole family. Thank you and let me know how you enjoy it. This looks delicious. Didn't ever imagine you could make a dish like this with Bush's Beans. I've always imagined them as more of a camping brand. Great idea. Thank you for visiting. They do make a good bean. This looks so delicious. I’ll definitely save this post and have my boyfriend do it since he loves chilies. Great. Thank you for visiting. and let me know how you enjoy it. 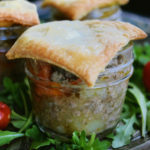 These look so yummy and so hearty! Perfect for this time of year. omg my son and husband would love this! their two favorite things, chili and peppers! I hope you all enjoy it if you give it a try. Thank you for visiting. Happy Valentine's Day. I hope that you enjoy it is you give it a try. Please let me know. Thank you for visiting.